Learning Arabic for free is certainly possible, though I would always recommend buying a book or a course that can be used as the main tool of instruction. There are plenty of free resources online that can help you with studying Arabic at all levels, whether you are a beginner looking for basic language learning material or you have some experience with Arabic already and are looking for more advanced material. Explore the list of free stuff below at your leisure, but don’t let the urge to explore all of these links get in the way of your learning progress. Just a quick word of warning: Arabic is a marvellous language, but also bewilderingly diverse. There are many different dialects spoken in the Arabic world today, with different vocabulary, sentence structures and accents. 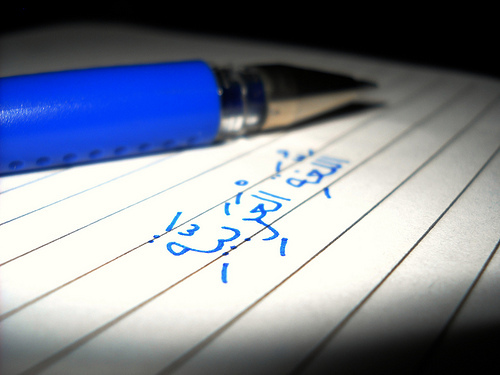 However, every Arab will understand some degree of Modern Standard Arabic (MSA or fuS-Ha), the language used in the media, in writing and on formal occasions. The resources below are primarily geared towards MSA, but I have included a section on dialects too. Primarily aimed at those with at least a rudimentary knowledge of Modern Standard Arabic (MSA), this two part series of articles aims to explain the main differences and idiosyncrasies of the Egyptian dialect. This list is not exhaustive, so please let me know in the comments below if you’ve come across a useful website that might help others to learn Arabic for free. This entry was posted in Learning Arabic and tagged alphabet, dialects, free resources, grammar, learn Arabic for free, phrases, vocabulary, words by ArabicGenie. Bookmark the permalink. I CAN BE ONE OF FRUITFUL STUDENT THROUGH YOUR CONSISTENT TEACHING AND SUGGESTION .